In this article about cornering we will not talk about cornering with normal road car. This is simple, and you should be careful only during preparation for corner entry. There are a few simple rules you have to take care of. Most of that you can read in braking article. There is no racing line and stuff like that, just adjusts your speed, don't brake during cornering and bear in mind weight transfer. In this article we will talk only about racing, and racing line trough the corner. Kinetic energy is the energy of motion. An object which has motion - whether it is vertical or horizontal motion - has kinetic energy. The amount of kinetic energy which an object has depends upon two variables: the mass (m) of the object and the speed (v) of the object. The following equation is used to represent the kinetic energy (KE) of an object. This equation reveals that the kinetic energy of an object is directly proportional to the square of its speed. That means that for a two time increase in speed, the kinetic energy will increase by a factor of four. Kinetic energy is a scalar quantity; it does not have a direction. Unlike velocity, the kinetic energy of an object is completely described by magnitude alone. Isaac Newton (a 17th century scientist) put forth a variety of laws which explain why objects move (or don't move) as they do. These three laws have become known as Newton's three laws of motion. The focus here is Newton's first law of motion - sometimes referred to as the law of inertia. An object at rest tends to stay at rest and an object in motion tends to stay in motion with the same speed and in the same direction unless acted upon by an unbalanced force. The behavior of all objects can be described by saying that objects tend to "keep on doing what they're doing" (unless acted upon by an unbalanced force). If at rest, they will continue in this same state of rest. If in linear motion, they will continue in this same state of linear motion. The state of motion of an object is maintained as long as the object is not acted upon by an unbalanced force. All objects resist changes in their state of motion - they tend to "keep on doing what they're doing." Inertia: tendency of an object to resist changes in its velocity and direction. But before we can start with discussion about cornering, it is important to acknowledge importance of suspensions. If they are not set properly, or there is some malfunctioning or lack of maintenance, all this theory we will talk about are useless. In addition to keeping the chassis off the track, race car suspension springs or roll-bars serve the same basic purposes as passenger car springs. The springs isolate the components (and the occupants) of the vehicle from road shock. They control the pitch and roll attitudes of the car and, in concert with the shock absorbers, the rate at which these attitudes change in response to the forces of lateral, longitudinal, and vertical acceleration. Finally, again with the shocks, they keep the tires in contact with the road surface as constantly as possible. Actually, shock absorbers do not absorb road shocks, the springs do. The shocks control the release of the energy stored in the springs when they are compressed. Racing imposes more stringent requirements than road drive, which include better accuracy of manufacture, minimum practical size, and weight, along with absolute consistency of performance. To realize the performance benefits offered by sophisticated shock absorbers, the springs must be absolutely consistent in load at height, rate, and linearity. HUH..., Now we can start with discussion about cornering. When taking corners the aim is to keep the car balanced throughout the bend. We are talking balance between the front and rear of the car. When you are driving near the limit of grip you really want to spread the weight evenly otherwise overloading the front or rear tire can cause you to lose grip. When you lift off the throttle or brake the weight is thrown forward, when you accelerate the weight is thrown to the rear. Using a trailing (semi open) throttle you can keep the corner grip and take the corner at the fastest speed possible. These techniques should only be applied on the track - it is foolish to push your car to the limits on the roads without the safety of run off areas. Good techniques learnt for the track will one day come in handy when you hit a slippery road or if road conditions change suddenly. Braking during cornering is a big NO. If you remember one thing from Braking and advanced braking article make sure to never brake on a bend. Braking really upsets the cornering balance and will nearly always cause problems especially if hard braking is required. Cornering plays an important role in deciding the outcome of races. Engine and brakes play crucial role on the straights but on the corners, the driver's skill is major factor. Factors like dirt, wetness and overall car balance also play a part on cornering. There are some important items we have to know to understand cornering. Concept of traction circle is the fundamental principle of efficient cornering. The car tires have longitudinal grip of braking and acceleration. Expert drivers overlap the different phases of braking, turning and applying power on the tires. They try to exploit the overlap to the best. They make effort to best utilize the traction circle, meaning they try to make the tire move as long as possible when applying pressure. To learn more about traction. Other basic principles of cornering are oversteer and understeer. This deals with which end of the car runs out of grip first. In oversteer back end of the car loses adhesion and tries to overtake the front. In understeer the front end breaks free first and the centrifugal force makes the car run wide. Now let us understand one thing. The road cars are naturally made to understeer, and the race cars are naturally made to oversteer. That's because understeering is stable, it slows down a car. On the contrast, oversteer is unstable. If the driver is novice, it could result in spin. With skilful use of steering, brake and throttle (heel and toe), the driver can avoid spin. But the racing car is designed to oversteer. This enables a skilled driver to carry far more speed through a corner than understeer. And with use of heel and toe technique skilled driver can turn oversteer to understeer and vice versa. The racing line is the imaginary line a driver should follow to travel round corners quickly. The basic assumption is that a straight line between two points is usually the quickest route. The tighter the corner, the slower you'll have to go to get round without losing grip. By using all the space on the track, you can usually create a straighter route, and thus keep the speed up. However, there are various additional factors which determine the perfect racing line which are discussed below. It is important to remember that there is rarely a perfect line through any corner for all conditions. It depends on the characteristics of your car, your cornering strategy, and the conditions around you. You should experiment with different lines and learn from people who know the track well. Every corner is made of three parts. We'll call them the entry, the apex, and the exit. The entry is where turning begins. > Neutral throttle zone before apex. The apex is the point where the car reaches the furthest point on the inside of the turn. The exit is where the car is driving straight again and we can divide this zone to acceleration and full throttle zone. Now we can explain each of these parts. To get the best times on the track you need to be either accelerating or braking at all times while on the straights - any coasting means you're losing precious seconds! Try to accelerate all the way up to the braking zone and use maximum throttle up to the last moment. How good are your brakes? How quickly can you reduce your speed from 200kmh to 50? How does your car behave when weight transfer happened? How does your car behave when the front wheels are locked? How brave are you feeling and how hard balls you have? 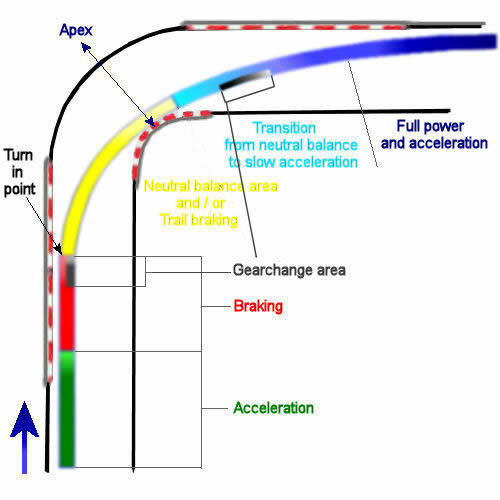 All these factors determine your braking point. It's a sensible strategy to brake earlier as you're learning the track and your car, and progressively shorten the braking area as your experience grows. The rule of thumb is to get most of the braking out of the way before turning into a corner, although a light brake pressure on entry can help to reduce understeer and can give a better turn in (this is known as trail braking). Try not to turn in if any of the wheels have lost traction. Check advanced braking article to learn more. Before you turn into the corner you'll usually need to change down. The golden rule here is to select a gear which will allow you to accelerate out of the bend efficiently. Heel and toe shifting is an essential technique to master here as it allows you to brake and change down simultaneously while avoiding transmission shock loads which can unbalance the car and cause unwanted weight transfers. Check my advanced Shifting Technique article to learn more. When turning in, ensure your steering motion is smooth and progressive. The perfect corner involves tightening the steering until the apex and then gradually unwinding the steering lock. If you find yourself increasing or correcting the steering lock as you're traveling through the corner after the initial turn-in you've probably taken the wrong line. To get the line right, it is vital to turn in at the correct point. Leave it too late and you'll miss the apex, too soon and you'll have to tighten your line mid corner. Get this right and you'll have set yourself up for a good corner. Remember that the apex may be further round the corner than you can see, so make sure you learn the track and the apex points before driving in anger. The largest demand on the grip reserves of your tires occurs at the point of turn in up to the point of apex. It is vitally important not to place additional demands on the tires by accelerating or braking. This isn't to say you can't retain a constant speed, but the important factor is that the car is in a neutral state until after the apex. Understeer or oversteer are most likely to occur at this point. You can use trail braking or trailing (semi open) throttle to carry more speed to the corner, or use again heel and toe to ad to the balance. The apex is often but not always, the geometric center of the turn. Hitting the apex allows the car to take the straightest line and maintain the highest speed through that specific corner. It is also the tightest part of a corner and the point at which you are closest to the inside of the corner. It's also called the clipping point. Once you have hit the apex you should be able to reduce the steering lock and increase the throttle. Determining the apex can be tricky but the guidelines below explain how to do it. There are two different types of apex, the geometrical apex (fixed or traditional), and the racing apex (fluid - early or late). The geometric apex of a constant radius corner is the central point of the corner, which may also be the racing apex, depending on the context. Confusing! For a majority of drivers front-end grip and front-end feel mean precision of corner entry and tool to carry a lot of speed into a corner and maintain it through the apex and in the same time a good feedback from the front tires. In this way they can feel, without guessing, exactly what the front tires are up to, and carry the speed into the corners and keep it up in the mid-corner. I think it's the fastest way around the corner and when you get the car working for you as you want, the fastest maximum speed can be found that way. Without the response from the front end, some drivers cannot make the fine adjustments that allow them to carry speed in the most efficient way through the corner and if you cannot put the car where you want and brake where you want because of front locking or sliding, then it becomes a guessing game about where you are going to be. And if you miss a little bit the corner you are going to miss a lot of speed on the next straight. It sounds like a small thing, but around one lap when you keep guessing every corner it creates quite a big deficit. To carry maximum speed through a corner, you need to take the route that minimizes the corner radius, thus minimizing cornering force and frees up precious grip for keeping the speed up. This route put apex near the geometric apex of the corner as is usually know as the classic racing line. In picture above, the green line is a constant radius 90 degree right hander and the geometric apex is exactly half way around the corner. Early apex maximizes the use of speed from the incoming straight; this is used when approaching a corner where the following straight is a lot shorter than the straight before the corner, or if we have to outbreak somebody during the overtake. Oddly enough, carrying the highest average speed round corners may not be the quickest way around a track. As mentioned, the objective in any corner is to have the highest exit speed. In addition to increasing the corner radius, this also involves taking a line which allows the earliest possible point of getting back into the throttle. To do this, the car must be straightening back out on the corner exit path as early as possible. Blue line in the picture above is the late apex and this is generally regarded as the best strategy for racing, with a slightly lower entry speed but a faster exit speed. The entry and exit affects the speed into and out of the corner onto the following straight. A late apex is used to maximize the acceleration onto the following straight. The amount of grip available is the factor which determines how late you can brake and apex. If you are late with braking point, or you are tying to outbrake somebody during overtaking from inside line and you are to long in entering the corner, very important is to try to make corner entry as straight line as possible. In this case you can use early apex marked on the picture with blue line. It will make possible to apply brakes without strong steering input with smaller risk of unsettling the car stability. With early apex you have highest entry speed but exit speed is the slowest. A hairpin is a corner which turns 180 degrees. In this case, the apex for the late apex racing line is about three quarters of the way around the bend. Early apex is about one quarter in the bend. As we sad before, on a race track the important thing is your exit speed. We all know that a car which has a greater distance to accelerate will be going faster than a car which has only been accelerating for a shorter distance. When approaching a tight apex slow up and aim to take the late apex of the bend leaving you a long gentle arc from this apex point. By doing this you are turning a long sweeping bend into a tight bend with a long straight and this means that you will have more chance to accelerate. Once you've hit the apex, you should be able to start reducing the amount of steering lock. As you are doing this progressively increase the throttle up to the point of full power. Always bare in mind what we learned in traction circle article. The point at which you can apply full power depends on your car and racing line you are using. Some cars will be able to apply full power straight after the apex, depending on the severity of the corner. By now you should already be thinking about the next corner and position your car appropriately to allow you to use the racing line. The position and direction of the next corner will also affect the apex, for example, if the next bend is a left hander you'll need to move over to the right hand side of the track, and thus will need to apex later. If the next corner is another right hander an early apex would be more appropriate. This approach works for corners which require hard accelerating cornering out of them, which will be most of them. However, there are many types of combinations of corners which require some analysis and preparation before race to understand the best approach. In drifting one should aim the front of the car towards the apex to initiate a high-angle drift. High-angle drifting keeps the front of the car facing the apex, blocking the opponent from overtaking. Depending upon cornering situations, techniques like trail braking can be used to maintain more speed upon entry of a corner, and attaining more grip while turning into the corner, and has an effect on apex selection. In this technique, brake pressure is applied slightly later than usual upon deceleration, and is maintained during steering input, sometimes all the way to the apex. The action of braking causes a weight transfer in the vehicle, shifting more weight from the rear of the car forward to the front tires, increasing the normal force on them and in turn increasing the amount of traction the front wheels have. Because of the characteristics of weight transfer, this technique causes weight to be shifted away from the rear of the car, resulting in lower rear traction, and can be used to induce oversteer in some cases. In this situation you can use heel and toe technique. All of the above guidance depends on your driving style and the car you're using. You will not be able to use all the power of a Bugatti Veyron or F1 car until you're completely in a straight line, with this kind of car you will have very distinguished acceleration and full throttle area. However if you're in a lighter less powerful car you can apply the gas much closer to the apex point. It's very rare to achieve the perfect corner, it takes knowledge of the track and the car and a great deal of practice! There are many corners with famous names, such as the Parabolica at Monza, Spoon in Suzuka or Becketts at Silverstone. But those are not the corners that can decide a race: on every track, the corner the drivers pay most attention to, and which commands the most interest from the fans, is the first corner after the race begins. The battle for the first corner is very brief. When the start lights go out, the drivers have just a few seconds to get into position among the mass of 20-30 cars or motor bikes charging towards the eye of the needle at the end of the start/finish line. For them, the stakes are extremely high. The battle for the first corner is one of the most exciting moments in any racing, and especially in Formula 1 race, where overtaking during the race is very difficult. It is no wonder that the drivers prepare for it specifically. Because every track is different, it's important to analyze the racing lines through the first corner using video recordings from recent years. It is much easier to catch up or lose places at the start than during the rest of the race. So only one motto applies for the drivers up to the first corner: keep your eyes straight ahead and put your foot down. Of course, every driver tries to approach the first corner on precisely the ideal line, which as a rule is an extremely narrow corridor and only has space for one car. So the drivers have to concentrate fully on the perfect position and the right braking point and also watch very carefully what is happening in front, behind and next to them. In these few seconds at the absolute limit, one thing is clear: anyone who makes even the tiniest mistake can not only completely ruin his own chances, but also those of his team mates or his rivals. In no other phase of the race is the pressure so great, or must they absorb and process so much information at the same time. Because jostling is inevitable in the battle for the first corner, the FIA has done a great deal to make sure it doesn't have serious consequences for the drivers or spectators. The implementation of generous run-off zones in first corner area has guaranteed greater safety at the start, in the same way that the restriction of frequent sudden lane changes on the start/finish straight. As a result, the car in front can now only change position once to prevent the car behind from overtaking. A great deal was done to improve the safety during the conversion of this high-speed track. There are now generous tarmac run-off zones. But the drivers like to integrate them into their driving line so they can make corner wider and be really fast.